Development of Heavy Tanks T29 and T30 was initiated in late 1944 in an effort to provide a tank possessing greater fire power and better armor protection than Medium Tank M26, yet equal to or superior to that vehicle in performance. It was visualized that one or both of these tanks would be required for use against fortified positions and heavily armored enemy combat vehicles. Neither of these two vehicles was available for use in World War II. 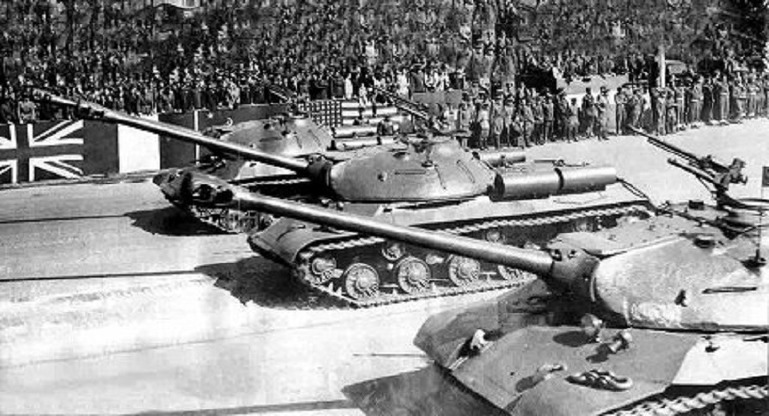 One model of the heavy tank series contemplated at the time of initiation of the T29 and T30 development was the Heavy Tank, T34 with 120mm gun T53. This tank has not yet been produced. Also in this weight class and in the pilot stage are the British FV201 at approximately 64 tons, and the US Heavy Tank T32, a more heavily armored and gunned vehicle of the M26 type weighing approximately 60 tons. a) Imposing a limit to the distance between objectives. b) Increasing co-operation between tanks and infantry, and assault guns and infantry. c) Increasing use of the assault gun in the support role in the place of the tank. 2) Both the Germans and the Russians employed heavy tanks (Over 56 tons) in World War II. The core of the Soviet armor was the medium tank which was the main shock weapon, with all other armor designed to support and protect the medium tank, or to eliminate enemy resustance shattered and disorganized by the assult of the medium tanks. The heavy tanks supported the mediums by fire. With greater fire power and range, the heavies lay back and engaged the more difficult targets. In dealing with well fortified positions, it was the practice of Russian medium tanks to proceed some 440-550 yards in advance of the heavies. Mediums advanced in force and compelled the enemy to disclose his anti-tank positions by offering a challenge more direct than could be provided by a reconnaissance in force. Occupying previously reconnoitered cover positions, the Russian heavy tanks then used their superior range and weight of shell to eliminate the enemy’s anti-tank defenses. Their armor, combined with their selected positions and greater ranges furnished relative invulnerability. 3) The history of World War II indicates that the use of heavy tanks not only was feasible but considered necessary by both the Germans and the Russians. 4) It is also apparent that the British consider the heavy tank feasible. They have plans for the employment of a universal tank with a limit of not to exceed 70 tons. Their universal tank now under development is in the heavy tank class but does not approach the 70 ton limit set by General Staff policy. The British are also pushing their bridge program to obtain Class 70 bridges in the division thereby keeping up with or even outstripping the trend in tank development. a) tactical mobility of the medium tank as opposed to the heavy tank. c) Shipping: More medium tanks could be shipped overseas than could heavy tanks. 6) To compete with the more heavily armored and armored German tanks, the US found it necessary to employ the tank destroyer armed with a 90mm gun. 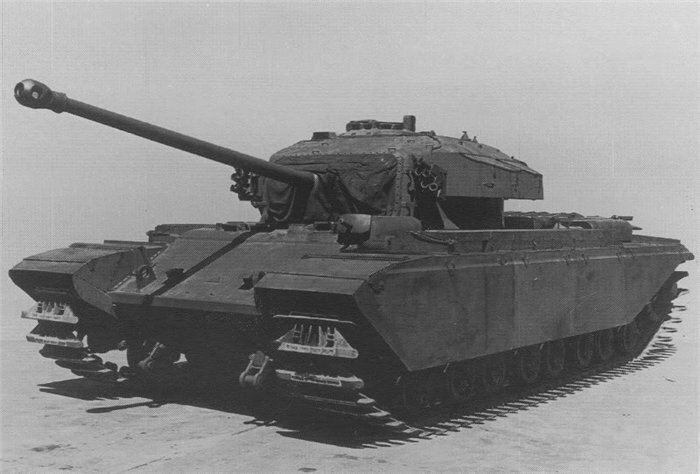 Towards the end of the war, the M26 tank also armed with the 90mm gun was introduced. 7) It is now established policy in the US Army that the tank destroyer can be eliminated and its mission performed by a tank. e) Control: “It may be that overall advantages will be obtained by having a control chamber in which the crew are housed and live together, and which is built for their comfort. The tank would have to be driven and all armament loaded, layed, and fired by remote control from this chamber: Similarly a commander would navigate and control his tank and his formation, and receive and transmit orders and information all from within this chamber. f) Anti-tank weapons. The British do not depend wholely on armor to defend against armor, but employ both towed and self-propelled anti-tank guns. By using a light type vehicle they are able to mount a much heavier gun in proportion to total weight than can be mounted on a tank. Now under development is a 20-pounder self-propelled gun whose total weight will be around 26 US tons. (SP Antitank FV303). The War Department Equipment Board (Stillwell Board), 29 May 1946, states that the heavy tank should be developed for heavy assault action and break through, and that it should be capable of destroying any armored weapons that the enemy may place upon the battlefield. Conflicting requirements between gun size, destructiveness, and mobility, versus armor protection should be resolved in favour of the gun and mobility. a) “The heavy tank should have superior fire power; posess superior tactical and excellent strategic mobility; and should be capable of safely traversing ordinary minefields and negotiating common obstacles. It should be very heavily armored, with front armor capable of withstanding any probably antitank fire, and should not exceed 75 tons in weight. The standard gun should be of approximately 90mm caliber, capable of penetrating 10 inches of homogeneous armor at 30 degrees obliquity at 2,000 yards using special ammunition. The tank also should be capable of mounting a gun of approximately 105mm caliber, capable of penetrating 10 inches of homogeneous armor at 30 degrees obliquity at 4,000 yards using special ammunition. b) In view of the present and future potentialities of tank armament, mobility and maneuverability; development of the thin-skinned highly gunned tank destroyer vehicles should be terminated. c) The presence of armor on the battlefield always attracts enemy armor. It is imperative, therefore, that the tank class of weapons include one type of gun that is sufficiently powerful to knock out any weapon that the enemy may place upon the battlefield. d) The Armored Conference at Fort Knox, Kentucky, 13 May 1946, concluded that “in separate tank battalions or tank battalions organic within the infantry divisions, a medium tank not exceeding 45 tons or heavy tank not exceeding 75 tons,” is required. These weights should be used as a guide and should not be a mandatory limit on development. e) The Infantry School recommended to the President, AGF Board No 2(Armored Board) in a letter dated 30 April 1947 that the weight of the infantry support tank should not exceed 35 tons, the gun should be capable of penetrating any known enemy armor at 1,000 yards and at 50 degrees of obliquity, and fire a projectile weighing approximately 25 points. The frontal armor should be sufficient to withstand penetration by an enemy projectile of the type the proposed tank gun would fire. In their modernity the Red Army tanks and self-propelled guns are typical of a basic policy of USSR designers. The objective of this policy is not merely to seek to match the best the enemy has put in the field: It seeks rather to produce materiel which will anticipate enemy developments and keep Soviet advantages at least one step ahead of the enemy. a) An excellent example of this policy is the prize Soviet armored vehicle the heavy Josef Stalin tank which Nazi propaganda featured as a formidable weapon. Essentially, the Stalin series represents improvement of the KV heavy tank chassis developed prior to the outbreak of the war. It resembles the KV in some respects, and it incorporates many of the most successful elements of the long line of battle-tried KVs, particularly the suspension and engine. c) Soviet designers, it is believed, are continuing to take an interest in even heavier tank armament. Undoubtedly, they are attempting to produce a weapon for heavy tank roles in excess of 122mm in caliber. Since the Soviets have adhered to the policy of adapting successful field pieces to armored roles, it is not unlikely that the next weapon to be installed in their heavy tanks will be of 152mm caliber. There is considerable conjecture, however, as to the feasibility of installing a weapon of this size in a tank at the present time, principally because of the weight factor involved. d) The Soviet Union possesses large numbers of some of the world’s most effective tank and self-propelled weapons. By following a policy of producing newer types of weapons for standard issue, the Soviets have done much since VJ-Day to improve the quality of the materiel in the hands of their troops. The important point is that the Soviet Army is in possession of these newer weapons in quantity. Although Germany is now a defeated nation and no longer has a military force, her armored equipment demanded respect from the allied soldier who had to deal with it. A study of the facts that goverened the design of German armored vehicles may be of some assistance in guiding out own development of heavy tanks. a) An interview in June 1945 with Herr Stiele von Heydekampf who became President of the Panzer Kommission in 1943 and as such was responsible for the German armored program throws much light on the German general policy with respect to armored fighting vehicles. b) The development of 30-35 ton tanks was begun in 1938. 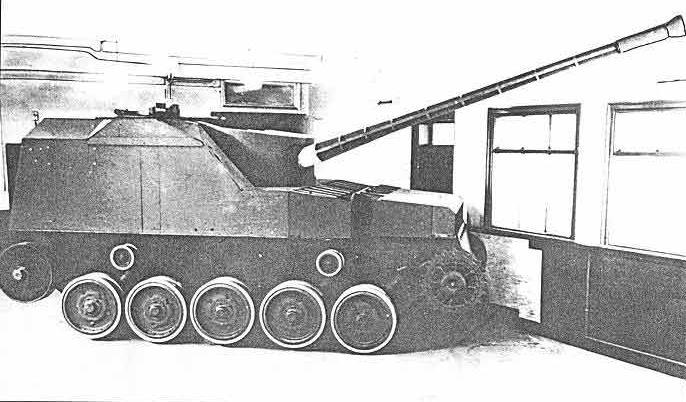 Such vehicles were being tested in 1940 and 1941 when the original Russian T-34 tank was encountered, the German Army Staff decided to abandon the current development program and demanded production of still heavier tanks. As a result, the Tiger I and Panther development and production were pushed more rapidly than any previous projects. 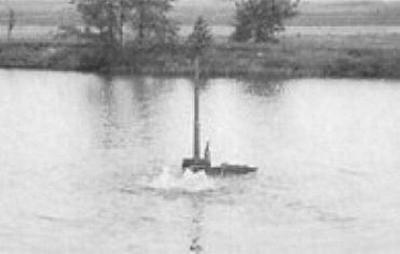 In Heydekampf’s opinion, the program was pushed too rapidly with the result that many mechanical difficulties were encountered in service. 1. Extensively protruding gun which the Germans had previously considered impracticable. d) The Tiger I was the outcome of design competition between the Henschel Tiger which was accepted and the Porsche Tiger which was unsatisfactory. After the Tiger I had been used for a short time, so many troubles were encountered that a redesign was ordered along the lines of the Panther which was developed a few months after the Tiger I. The Tiger II resulted. It was Heydekampf’s opinion that the Tiger II tank was close to the limit of weight for steering, mobility and size having in mind the limitations of railroad transportation. Further, there were doubts in the minds of tank people that a tank of the Tiger size was the most suitable. e) General Guderian representing the Armored Forces wanted vehicles with full 360 degree traverse gun turrets. Other branches of the Army favoured limited traverse mounts because larger guns could be mounted on vehicles of a given weight. This latter viewpoint won out because it was supported by Hitler under the influence of Saur. Consequently, the number of lighter tanks equipped with limited traverse guns constantly increased. f) The size of German heavy tanks was limited in two ways. 2) By the limit of the length-width ratio which could be steered. h) Heydekampf stated that as the military situation deteriorated, so the level of mounting larger caliber guns increased in tempo. This trend was favoured by the artillery arm, but not by the armored command. Heydekampf confessed the opinion that the Panther tank represented the most successful German tank design of the war. So these were the prevailing philosophies which were considered by the Armored Board. In Part 2, we’ll see how well the Armored Board figured that the T29 series could meet those issues. Click the bright orange button to take you to the forum thread. As ever, my Facebook page remains here, my Youtube channel here, and Twitch stream (Every Tuesday, and (very) occasional evenings) is here.